Here we discuss the basic ingredients of Public Relations: Topical Issues, The backdrop - economic and social, What makes PR tick, the pain points, the problems, the positives, the negatives... almost anything under the sun related to the communication industry! From being a strong AAP supporter, to an embarrassed AAP supporter, to a "seriously irritated" AAP supporter, my journey over the past 2 years or so has been eventful, to say the least. Speak Sense or lose all credibility: The unending war has caused major major damage to the profile of the main players - A Lt. 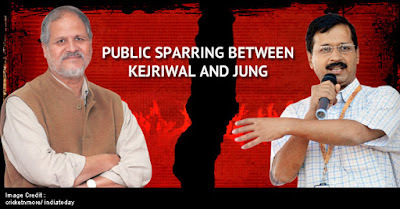 Governor has never been as badly ridiculed as Jung and a CM has never been called as big a "drame-baaj" like Kejriwal. These guys were very respected civil servants and social workers in their previous avatars and today anything that they say is taken with a saucer full of salt. Stop Abusing: You do not gain brownie points if you stoop to the adversary's levels... Their is a lot to be said about behaving like gentlemen that these people have proved that they are NOT! The cacophony is unbelievable. When we train corporates and even individuals in branding and communication, the core points of "let your work / actions speak more than your words", "never ever lose control", "Elucidate your points coherently" are some of the points we begin from. And we completely focus on creating the brand by showcasing the best that we have and not highlighting the worst of competition. All PR concepts come to nothing in today's political scenario. Never ever have we had such foolishness being promoted in the Capital as today and I think this will continue till the time both stop playing to the gallery and the media stops lapping up whatever they say/do! One can only hope that their respective media teams understand this and try to mend the situation, or else we will have no option but to use NOTA in the future elections! A communication professional who looks at stuff objectively. Given to extremes - no greys for me - most stuff is black or white! Believe in the tenet - change is the only constant - so likes and dislikes are also not constant!!! Very opinionated too! I agree, but one can only hope that better sense will prevail!!! Set up in 2000, Finese PR is a boutique communication consultancy based at New Delhi, with an investor relations strategy office at Mumbai. We are focused on providing communication solutions to the business needs of organisations. We are a "knowledge based" organization. We look at the key triggers that help generate the right kind of noises in the right circles. This could be about the existing initiatives or latest offerings in terms of products and services as well as highlight any other activities that can impact your target group. Customization is therefore the key to any offering and we ensure that the communication that is addressed to each group identifies and addresses what works for that group. In any initiative, Content is the king and we focus on what creating and sharing content that is relevant and topical. The focus at Finese PR is to provide effective communication solutions, customised to the individual requirements of the clients that revolutionizes the way they communicate!! !